Herb Gessner was born in 1941 in Portland, Maine. After graduating from high school, he attended Franklin Technical Institute for drafting, and enlisted in the U.S. Navy 1961. He was discharged 1966, and was Corpsman during the Vietnam War. Gessner worked in piping design for several shipyards across the U.S., finally retiring in 2005 from Bath Iron Works. In 1994, he started making wooden toys for family and friends. After his retirement, he began making them for retail sale. When not creating his beautiful toys, Gessner enjoys restoring his 1906 Victorian home, camping at Sebago Lake, riding his Harley Davidson and mountain biking. 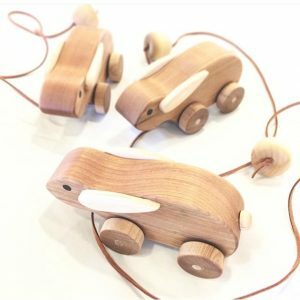 Herb Gessner’s wooden toys can be purchased year-round at the Center for Maine Craft.